The Fossil Sport is the most recent smartwatch to join the company's portfolio of devices. It brings many of the same features as Fossil's other fourth-generation smartwatches, but the Sport offers numerous colour options, whilst being the first to incorporate the Qualcomm Snapdragon Wear 3100 chip under its hood. We've spent some time with the newest addition to the Fossil collection to give you our first impressions. Is the Fossil Sport worth its pretty reasonable £250 asking price? The Fossil Sport is all about colour. The latest device to join the plethora of smartwatches in Fossil's portfolio comes in two sizes - 41mm and 43mm - both of which feature a nylon and aluminium 11.5mm casing in a dual-layer finish. The 41mm model features white nylon underneath with a dark aluminium casing on top, offering a more sporty, toylike approach, while the larger 43mm model has a dark nylon with a dark aluminium casing, for a more serious, smarter look. Both offer interchangeable, buckle-fastened, 18mm straps and there are a huge range of silicone straps from bright yellows and purples, to lime greens and fluorescent pinks - 28 to be exact. It's a great line-up and for those after a lightweight, smartwatch that really pops, the Fossil Sport is fabulous. The two Sport models feature three buttons on the right of the aluminium casing, just like the company's other generation fourth smartwatches, with a rotating crown in the middle for spinning through the Wear OS interface, and two customisable action buttons either side. On the underside of the watch casing is the heart rate monitor, again like the other Fossil smartwatches, such as the Michael Kors Access Runway. Put the Fossil Sport on and it's very light and comfortable to wear. The company claims it is the lightest smartwatch to date and it is noticeably so when you pick it up. It's the colours that really stand out for us though - we love how bright and bold you can make this device, whilst also having the option to keep things more conservative. It feels a little cheap, more so in the case of the 41mm model because of the white nylon underlayer, though this is personal preference. The display on both models meanwhile is crisp, vibrant and responsive from our brief experience. The Fossil Sport comes with many of the same features as Fossil's other fourth generation devices. That means you'll get smartphone notifications, as you would expect, but you'll also get heart rate monitoring, built-in GPS, NFC for Google Pay and activity tracking through Google Fit. We'd expect the Fossil Sport to work much the same as the Michael Kors Access Runway, offering good activity tracking but in a more practical format thanks to those silicone straps and lightweight body. Like other Fossil fourth-generation smartwatches, the Fossil Sport is also swim-proof up to 50-metres, offers music control and it provides the ability to change and customise watch faces, including using images from social media accounts. Where the Fossil Sport differs from other fourth generation Fossil smartwatches and other smartwatches full stop for that matter, is the use of the Qualcomm Snapdragon Wear 3100 chip. 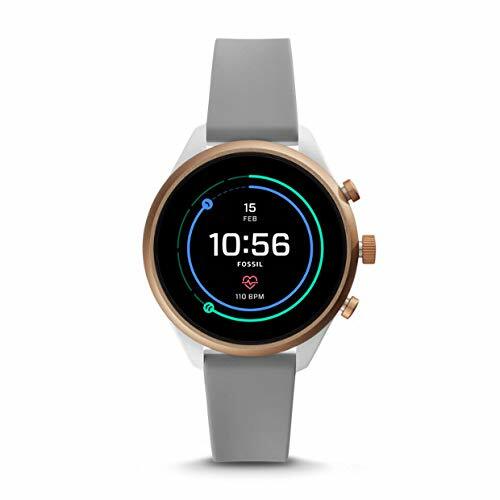 The Fossil Sport is the first smartwatch to use this new chip, which is said to ensure the device is able to deliver 24-hours battery, as well as a new ambient mode. We weren't able to test the battery life during our brief amount of time with the device but we would like to see a little longer than a day. The Samsung Galaxy Watch and the Apple Watch Series 4 both offer beyond a day, with Samsung's larger device hitting the four day threshold so over a day is now essential. As many will expect, the Fossil Sport runs on Google's Wear OS platform like Fossil's other smartwatches. The Fossil Sport we saw was in demo mode, but everything is the same as other Wear OS devices running the latest build of the software - which is significantly better than it has been in previous years. The main screen offers circular, uniformed icons, which can be scrolled through using touch or the rotating crown. Settings are accessed by swiping from the top of the display as they always have been, though more settings are now available, such as quick access to Google Pay. Notifications are accessed with a swipe from the bottom up, Google Assistant is accessed with a swipe from left to right, while Google Fit is accessed by swiping right to left. As we mentioned previously, the Fossil Sport has two action buttons either side of the crown, both of which can be customised. Like other Wear OS devices, the Fossil Sport is compatible with Android and iOS devices but Android users will get a more seamless experience. The Fossil Sport is a lovely smartwatch if you're after a lightweight, colourful device that will track your activity whilst offering features like built-in GPS, Google Pay and heart rate tracking. You won't get the kind of data detail you'll find with Garmin devices or Fitbit devices as Google Fit isn't as comprehensive, but it will give you a simple breakdown and the Sport is comfortable to wear in our experience. We'll be testing this device in full in the coming weeks to assess performance and battery life, but overall, our first impressions of the Fossil Sport are that it's a great colourful smartwatch that really pops in the brighter coloured straps, even if the 41mm model does sway a little on the cheap side.